Now in its second edition, Gynecologic Oncology Handbook: An Evidence-Based Clinical Guide has been thoroughly updated to include the latest advances in surgical techniques, chemotherapy protocols, AJCC 8thEdition staging criteria, and much more. This current edition contains illustrations that reinforce key concepts, algorithms for diagnostic techniques, and tables to guide you in optimal disease management. The handbook covers the spectrum of gynecologic oncology from seminal studies to guide the oncologist, to the essential workup for the Obstetrician/Gynecologist and related clinician. This handbook can be carried by the practitioner on the ward or in the clinic. It includes necessary details on gynecologic cancer screening and treatment regimens for preinvasive disease, to staging and management of all the gynecologic cancers such as cervical cancer, ovarian cancer, uterine cancer, vulvar cancer, vaginal cancer, and gestational trophoblastic disease. It highlights evidence-based best practices for managing these cancers, hereditary cancer syndromes, for surgical care, and for all adjuvant therapies including chemotherapy, radiation therapy, targeted therapies, and immunotherapies. Detailed sections on survivorship care, palliative care, as well as managing reproductive function and other comorbid medical conditions make this a ‘one-stop shop’ for navigating all clinical aspects and effects of gynecologic cancer. 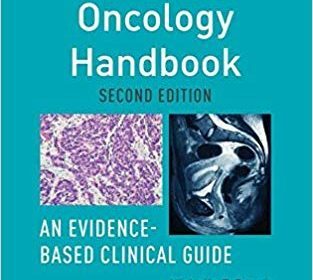 Featuring new and important clinical study references, medical comorbidity algorithms, directed gynecologic cancer workups and treatments, numerous tables and easy-to-reference illustrations, the Gynecologic Oncology Handbook, 2nd Edition is the ultimate quick reference for the clinical management of all gynecologic malignancies and related conditions. Provides Gynecologic Oncology Referral Parameters, Performance Status Scales, Adverse Event Grading, RECIST evaluation criteria, chemotherapy protocols, statistics, and other useful formulas.